SPCR • View topic - Fanless 130W ATX PSU with 120W AC adapter *Video. Fanless 130W ATX PSU with 120W AC adapter *Video. Post subject: Fanless 130W ATX PSU with 120W AC adapter *Video. I received today the 150W AC adapters. There are some bad news and some good new but i will start with the bad ones. 1.The power supply connector pinout (4pin) is wrong need to be 90 degree rotated (the workaround was to use a extension cable that will correct the pinout see the photos). 2.The AC adapter is heavy 820g plus the AC cord 160g total 980g and if I add the shipping box ATX cable adapter cable and PSU the total will be close to 1.4kg an this is bad because the shipping cost is higher. Some people asked if 150W power adapter is the best choice for the 130W PSU and the answer is yes becouse if you consider the PSU 90% efficient in order to output 130W it will need about 145W at input. DC cable is 1.8m + another 25cm for the extension cable. Last edited by electrodacus on Sat Oct 08, 2011 5:07 pm, edited 6 times in total. 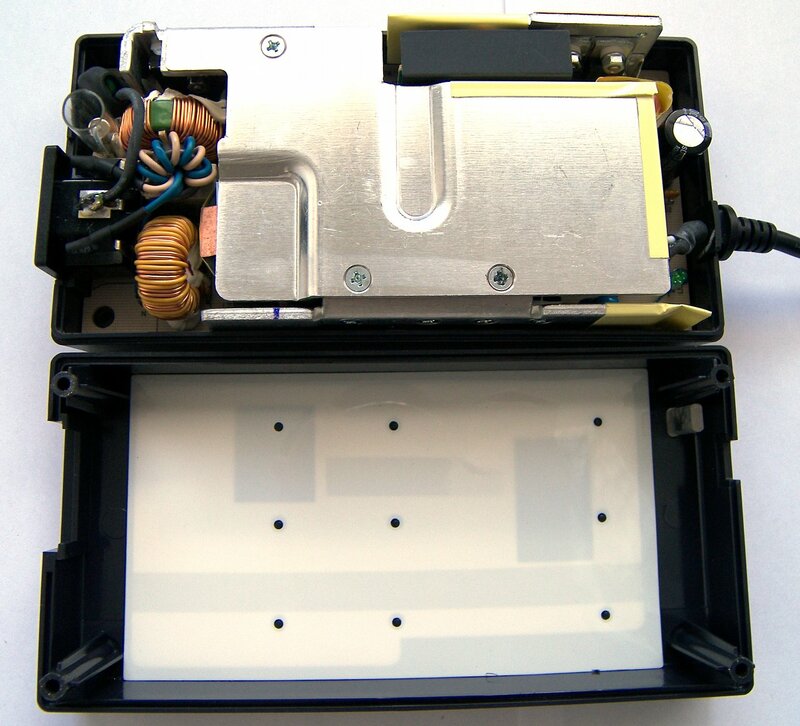 I know some of you are curios to see the inside of this AC adapter . Link to the same photos but better resolution if needed. Last edited by electrodacus on Fri Sep 11, 2009 1:41 pm, edited 1 time in total. Yes is good quality I'm happy with this. I had some 180W same size but less weight and the quality was far from this They did the job but they got a bit hotter and I do not know if they will have work long therm but this are really good it seems Delta is a good brand. And this one was really hard to open because they used a special screw head is a star with 6 corner but it also have a pin in the middle. 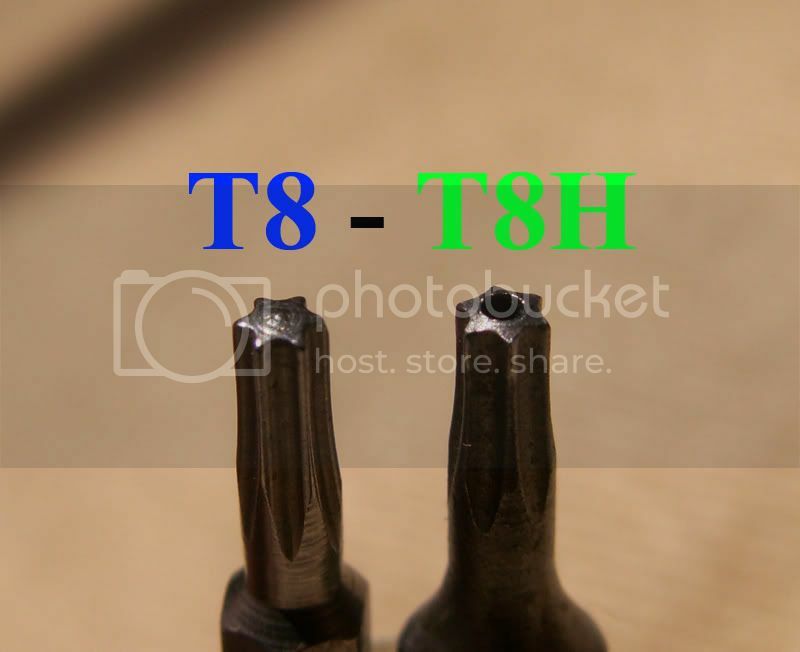 It's a security bit (Torx style), sometimes called a Star bit. They are not hard to find, most hardware and electronics stores usually have a cheap set. I will need the one in the right see the hole in the bit but I only have the one in the right at home. I know about this type of screws I used the same at work for airbag electronic control unit when I was working at Siemens. Anyway I do not need this anymore I was able to open one to do the pictures. I was hoping that I can correct the polarity problem of the 4 pin DIN connector but the cable only uses two 14AWG wires so I will continue to use the inverted extension cable it will work just fine is just more work for me to modify this extension cables. I need to buy one of your fanless AC adapters. I have a 150W Pico, and even though my system probably draws about 1/3 of that at max load, I have the usual 102W power brick that everyone else uses. It turns on its tiny, loud, annoying fan at only 50% - 75% of the AC adapter's rated max, since it gets extremely hot right away. 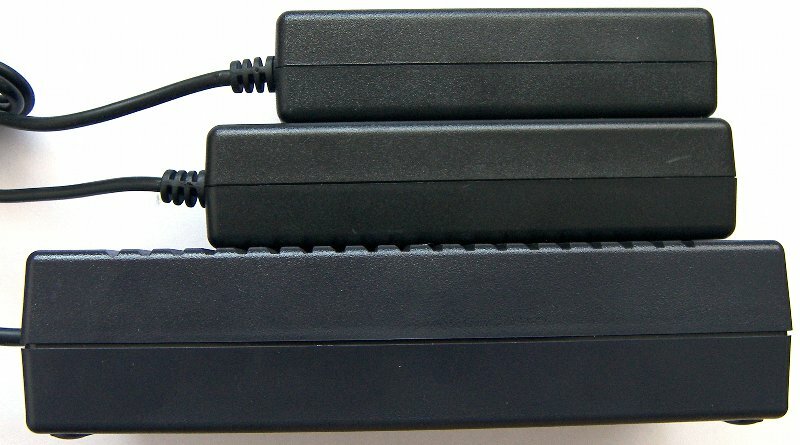 Sure, there are other fanless AC adapters out there that are capable of delivering 80W - 100W or more of power, but they involve modding and soldering, and I don't have the tools or experience to hack apart a Dell DA-2 or an Xbox360 brick. I need something silent, and soon! I'm tired of the PSU fan spinning up every time I watch a Hulu video or do some software compiling. I need silence! So . . . do let us know when and where your fanless adapters are on sale. I understand you (I also hate noise and fans). This is already for sale on eBay complete kit that include the 150W AC adapter and 130W ATX PSU for a total of 64.95$. just search on eBay for "ATX Y5"
Actually, electrodacus's adapters will also need modding. They come with a 4-pin DIN socket whereas you want a 2.5mm jack. You could connect them to a 4-pin Mini-fit Jr connector. I believe picoPSU already comes with a connector of this kind. See the thread MatingDell DA-2 and PW-200-V for some info on how to do this. My understanding was that he wants a complete KIT (PSU + brick) from me so he will not need any modding the connectors are included. If he will only want the brick that will not work because is a 19V output and not 12V as needed for picoPSU. Dang, it is a 19V adapter? I was afraid of that . 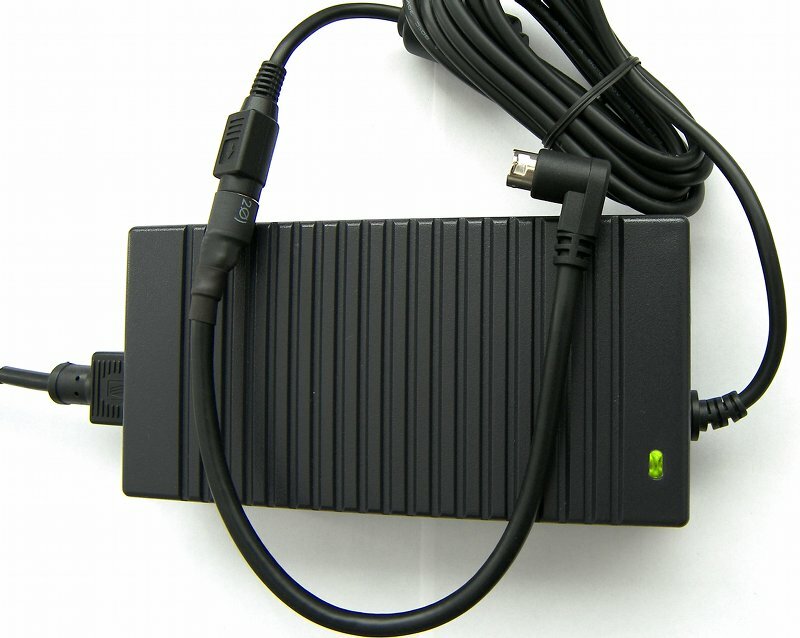 . . if I could handle 19V adapters, I could have used any fanless laptop brick out there. It's much harder to find 12V adapters to go with my 12V Pico. My Pico was fairly expensive, all things considered: $70 - $79 counting brick, Pico, and shipping+tax. I'm not anxious to spend a bunch more money on another power supply kit, especially one that I don't think could fit into my case, which is an Antec NSK1380. We were both wrong I was thinking you need the complete KIT and you were thinking that is a 12V brick (the 12V bricks are harder to find). Price is not always related to quality. The Antec NSK1380 is quite big will be no problem for this power supply or even bigger power supply. I was was thinking at the possibility of using two of this power supply in parallel but I guess it make no sense since all people that want a silent PC will not use more than 130W of power. It's much harder to find 12V adapters to go with my 12V Pico. Have you looked at short-circuit.com? This is electrodacus's thread. So, if you would like help in mating the power supplies, please come over to the "Mating Dell DA-2 and PW-200-V" thread. I will be quite glad to help because I am going through very much the same issues. I'll follow your progress there, but it looks like much the same situation as with the power supplies in this thread: there doesn't seem to be a working combination with a PicoPSU, which necessitates buying an AC brick and the DC-DC PSU. The supplies at short-circuit.com all look like they put out way too many amps: even the 100W fanless brick says it puts out 10A. If I recall correctly, the Pico 150 is only rated for 8.5A input. That would start to fry stuff, wouldn't it? Seems it's not possible to mix-n-match stuff from different vendors without soldering at some point. No. The current is not "put out" by the power supplies in the sense you are thinking. 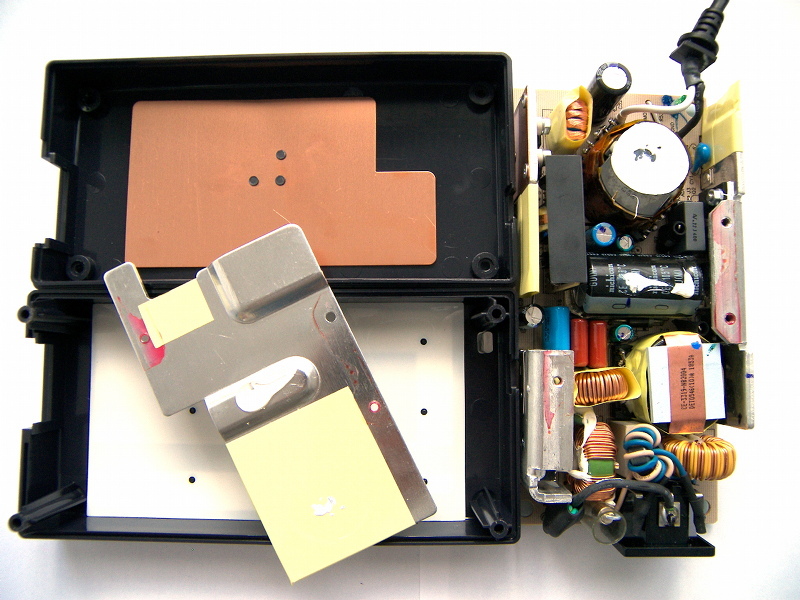 It is drawn by the circuits and devices that we connect to the terminals of the power supply. The rating of 10A only says that it is the maximum current that can be drawn from the power supply. If you draw less than that, the power supply will be quite ok with it. 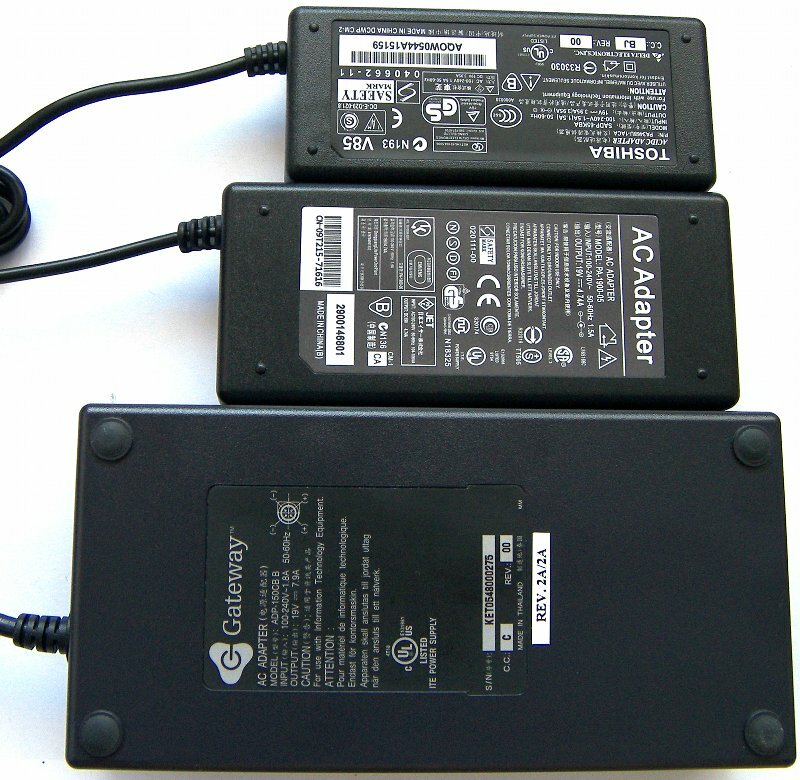 Your PC will draw current from the PicoPSU which will in turn draw current from the powerbrick. So it is perfectly fine to use a powerbrick that has higher wattage than the PicoPSU. The main difficulty we are worried about in mating the powerbricks and the Pico supplies is the connector that is used to mate them. This is somewhat like the tail wagging the dog! The 2.5mm jack and the Molex pins can handle somewhere around 6-8A of current. If you draw more current through them, they will overheat and might scorch whatever is in their vicinity. So, the Pico 150's manual says that, if the input current is expected to exceed 8A, then you should use a 2x2 Mini-fit Jr connector instead of the 2.5mm jack. Once you do that, the current gets split two-way, and each pair of pins will handle half the current. 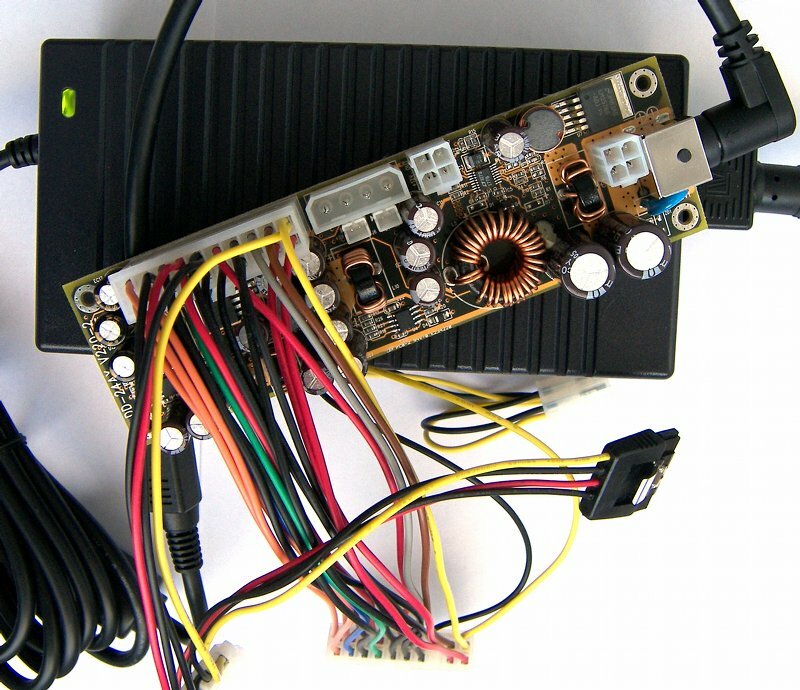 The only reason this is more complicated than hooking up a standard connector from Radioshack is that the Mni-fit Jr connectors are typically sold to OEM's and, so, the information about them is not tailored to end users. But, hopefully, the information I have documented on the other thread is helpful in doing this. Some soldering will be definitely involved. If you want to put a connector at the end of a wire, soldering is a common method. But if we are trying to put a 2x2 connector, then we have to split a pair of wires into two streams and connect them back at the other end. Soldering is even more crucial for these junctions. I haven't found any way to avoid this soldering. Electrodacus's set-up doesn't have this problem because his design uses a 4 pin DIN connector to start with. So, no end-user tinkering is involved. Restart. Now that I think about it, your problem is easily solvable. If you are able to make do with a 102W powerbrick currently, then you can safely replace it with a 120W or 150W fanless powerbrick that is available from short-circuit.com. No change of connectors is needed. Your system won't draw any more current just because the power supply has gotten bigger. You need to worry about connectors only if you expand your system. Last edited by reddyuday on Mon Sep 21, 2009 2:31 pm, edited 1 time in total. Restart. Now that I think about it, your problem is easily soluble. If you are able to make do with a 102W powerbrick currently, then you can safely replace it with a 120W or 150W fanless powerbrick that is available from short-circuit.com. No change of connectors is needed. Your system won't draw any more current just because the power supply has gotten bigger. You need to worry about connectors only if you expand your system. 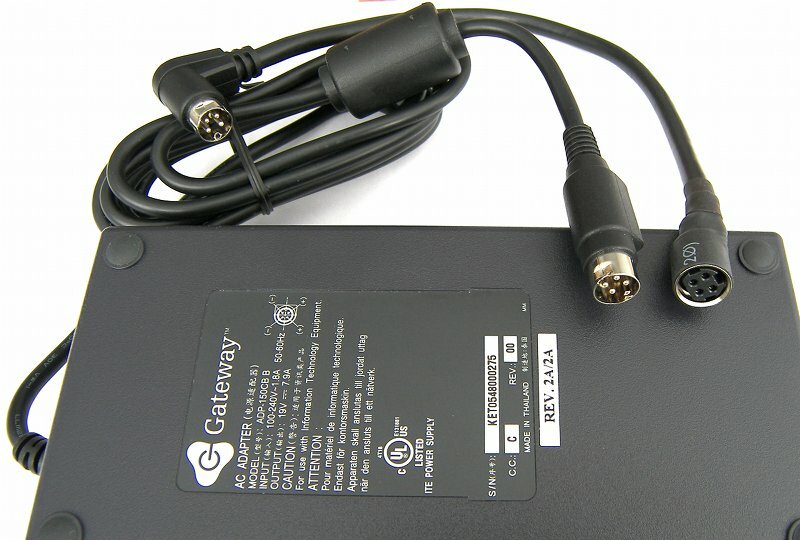 reddyuday is right if you do not have problem now with the 2.5mm connector you will not have any problem with a higher rated power brick because you will use the same current as now. 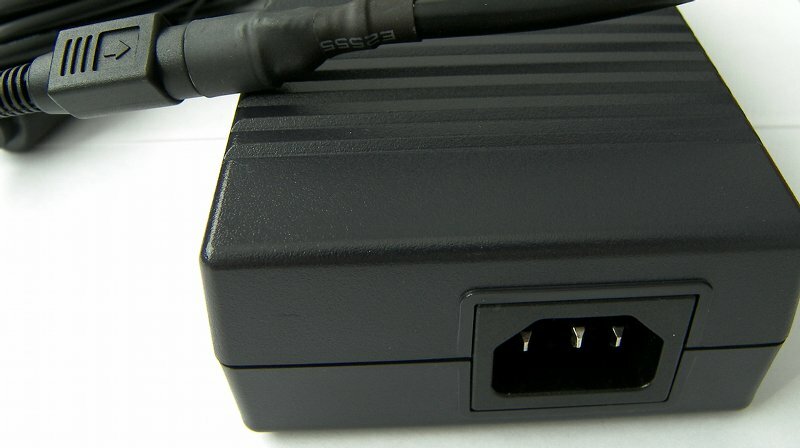 The problem is that no "real" company will use a 2.5mm connector on any brick that put out more than 5A so this bricks are probably not very good quality (probably not test or certification) and I will not use something like this unsupervised. As an example the power bricks pictured in this post use 14 AWG or 2mm^2 wires on the DC cable and this bricks only put out max 7.9A. Today I received some new bricks 90W and 75W. the 75W Toshiba is great can deliver 80W with no problem. But the 90W brick is not good can only deliver max 76W all that is over 4A will be cut by the current protection and this is not good I even have a 65W brick that can deliver more 80W so only 76W is not great so this 90W brick I will sell at the same price as the 75W one. I can not sell right now because I need to receive the 5.5x2.5mm panel connectors that will sell with this I recived wrong connectors they are 2.1mm so I lost some money hope this time I will receive the correct ones. ...it seems Delta is a good brand. True, generally speaking. It's the biggest power supply maker in the world capable of designing and producing almost any type of power electronics. Last edited by MikeC on Tue Sep 15, 2009 3:51 pm, edited 1 time in total. I must admit I did not know about Delta until recently. I see the 75W power supply is also made by Delta for Toshiba. I can see the difference in quality the 75W adapter made by Delta uses a 18 AWG cable for DC output and the 90W non branded uses only a 20 AWG cable for DC out but an interesting fact is that from my test it seems that the non branded 90W adapter is much more efficient I used both of them on my Quad core computer now I use the 90W one and is much cooler this will be a good thing even if is over specified can only output 76W. Could be that the Toshiba/Delta is simply an older design. The push for high efficiency has really happened only in the last couple of years. 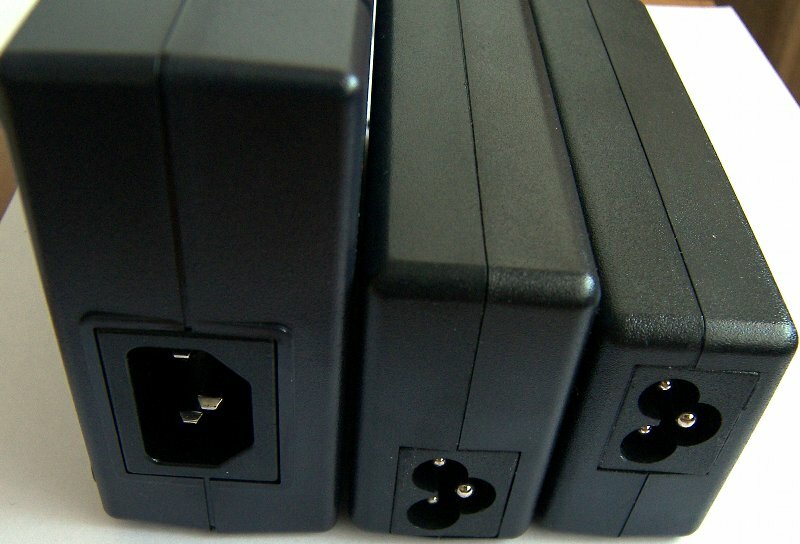 Energy Star maintains a database of high efficiency power bricks -- in excel and pdf format. I just tested the overcurrent protection on the 12V line (on the 130w ATX power supply) and is 13.2A using the 150W brick but is not limited by the brick even if 12.1V x 13.2A = 159W. the voltage on the brick is 19.28V with no load and 18.97V at 13A load on 12V line. Maybe someone is interested in this data but normally this is not important since you will be under 10A on the 12V line including the 5V and 3.3V load on the 12V line. Well I got the DC-DC PSU from electrodacus today. It seems to function correctly. I don't think I am going to bother whipping out the oscilloscope but I do want to make a little cable to help me measure current out of my brick when I get a free moment. Using a NEC brick from an old LCD I scavenged my system uses 43W at the outlet when idle. My system is a Athlon II 240 on a MSI 785GM-E65 and single 3.5" HD. The CPU is undervolted to 1.175V . I was hoping to get a little lower wattage then that. The drive will soon be replaced with a laptop drive which should help. At some point in the future I may try to find a better brick. This one is definitely older and might not be as efficient. I will say that for your system 43W at idle is quite impressive you have a powerful integrated graphic the board is also supporting 140W CPU so probably the CPU DC-DC converter is not extremely efficient on low power CPU Then 3.5" HD can contribute a little maybe 5W at idle the ad about the same for RAM probably and I do not know if you use some fans they can also ad something . The brick if is older than tow years is probably less efficient maybe around 80% the new ones are around 90%. you will find out when if you measure the current out of your brick. My system is 31W at idle maybe more since my measurements on AC are not accurate but I have a more basic system only one 5V fan and SSD (0.42W max) the CPU is only 4W at idle with the BIOS CPU voltage of 0.925V. Maybe you can get a bit under 40W if your brick is low efficiency and you will exchange for a better one. Please let me know if you measure the DC current I'm curios. When I came home today after sitting for a while the system had dropped to 39W. Just 4 more watts to reach my goal. I have two fans. The CPU and an 80mm panaflo which is running at 6V. I also have 2x2GB sticks of DDR3 ram. The CPU fan is set up to draw air from outside the case and after getting rid of the 3.5" drive I may remove the second fan. I also attached the laptop hard drive which I plan on using as the system drive to copy some stuff off it first. That did not add much power draw. I can't wait to get that dam noisy seagate POS 3.5" drive out of this system. I also removed a wifi USB adapter I was using and switched to Ethernet just to get a better connection. I am not sure what sort of difference that will make power wise. The CPU power supply is 4 phase but can drop down to 1 phase if the system is idling so I don't think the 140W design is hurting me that much. I am guessing the brick is over 4 years old. The back light on the monitor it came from had burnt out which should be a good indication that it is very old. I tried using a Dell laptop brick but it shutdown when I tried to boot. Maybe someone knows a trick to make it not do that. 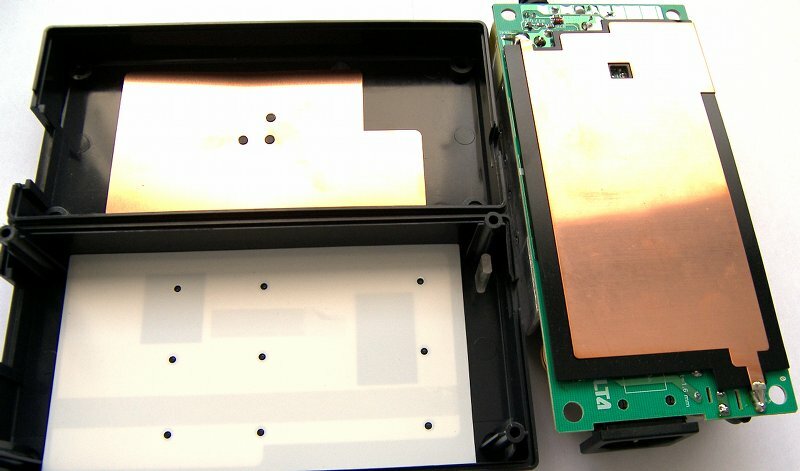 Dell bricks have a third line that the laptop uses to talk to the brick. I think it is mainly to keep users from buying third party bricks. TBH this afternoon I was just thrilled that I wired up the PSU correctly and didn't burn the system out. The Laptop drives are two up to 4 time less hungry. Depending on the model they can use 2W up to 4W so quite significant. This is good then you are fine. You need to take care of polarity when you supply this 130W ATX board is not protected to reverse polarity but if it happens the worst case you destroy the PSU but the rest of the system will not be affected. What is the system power with CPU at 100% load? What should I use to load the graphics chip?